For many years, despite growth in the population, the annual number of traffic fatalities on US roads would fall with each passing year. New vehicle safety technologies, coupled with greater awareness of the dangers of such driving behaviors as driving drunk or failing to wear a seatbelt, reliably resulted in lower death rates year after year. Unfortunately, this trend seems to be reversing. 2015 was the first year since the 1960s that deaths due to motor vehicle accidents were greater than in the year before, and 2016 is shaping up to be an even deadlier year than the one before it. According to preliminary estimates by the National Highway Traffic Safety Administration (NHTSA), fatalities on US roads were over 10% higher during the first six months of 2016 than they were during the same period of 2015. In fact, the first six months of the year are generally lower in fatalities, as weather improves and driving increases in the latter half of the year. 2015 was witness to a 7.2% increase in total roadway fatalities over 2014’s total. Experts are not entirely able to explain the cause for the increase in roadway fatalities. The most obvious explanation is that the growing economy and lower fuel costs resulted in a jump in total miles driven by US drivers. However, the total vehicle miles traveled by Americans rose by only 3% in 2015, and only slightly over 3% in the first half of 2016. This fact has left safety officials and policy experts wondering at the reason for the stark rise in almost every type of roadway fatality. Mark Rosekind, head of the NHTSA, described how an overwhelming share of roadway fatalities are avoidable. He explained that 94% of all accidents stem from human choice or error, ranging from a driver deciding to turn when it was unsafe to do so, to driving while intoxicated. “The data tell us that people die when they drive drunk, distracted, or drowsy, or if they are speeding or unbuckled. While there have been enormous improvements in many of these areas, we need to find new solutions to end traffic fatalities,” Rosekind noted. 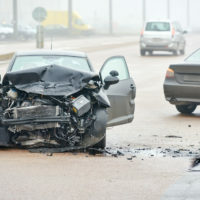 If you’ve been hurt in an accident in Idaho and want to determine if you may have a legal claim for money damages for your time spent off work, your medical expenses, and your pain and suffering, contact the compassionate and dedicated Twin Falls personal injury lawyers at Pedersen & Whitehead for a consultation at 208-734-2552, with additional offices located in Boise at 208-336-2552.